Thanks for being here! I'm the type of person that will pick up stray change from the floor. I know many who are also like me. See a penny, pick it up. A dime...oh boy! Find a quarter...well it's your lucky day. You should never pass by free money, and leave it for someone else. And if you agree with this, then maybe you'll agree with what I have left to say in today's financial literacy post. 1. Buying your own money! Huh? You heard right. Ever go to a locale, like a barber shop or eatery and find out they don't take your ATM card? Oh darn! "But I don't have cash on me. Ooooh....there's an ATM machine." How convenient for everyone, but you! These cash dispensers charge $1.50-$2.00 to let you withdraw your own money. Why would you agree to this? Unless you're on a date and don't want to look stupid, do what I do: Bounce on out of there. Heck no, I'm not buying my money! And neither should you. 2. The 35 cent rip off. Do you drive? Sure you do. How often do you go to the pump each month? I'd say most people, unless they drive a hybrid or electric vehicle, will stop to get gas at least 2.5 times a month. You insert your card in the slot and get this prompt on the small screen: "A 35 cent debit fee will be applied for this purchase. Agree?" 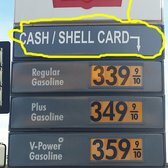 ARCO is notorious for charging a 35 cent debit fee in California. The sad thing is, most of us are too damn preoccupied, trying to get to work on time or something, to pay with credit or cash. Then, there's the extra dime you paid per gallon by not paying inside with cash. Moral of this story...carry cash! 3. Paying your bank to let you use your own money. Wells Fargo will charge you $19.95 for a box of duplicate checks. That's insane if you're ordering more than once a year! Why are you writing so many checks from your personal checking account? Pay for all of your bills, e.g., water, electricity and gas, cell phone, mortgage, etc., online like the rest of us in the 21st Century. There's also Paypal and even Bitcoin if you want to eliminate the need for checks altogether. There are so many other annoying bank fees that I could devote an entire blog post to them. Don't be fleeced! 4. The minimum slap in the face. You're at a shop, a store, a merchant's place you want to reward with your business. You can't wait to take your inexpensive trinket or food item, whatever, with you and be on your way. You present the cashier with your credit card. "I'm sorry, sir," the nice gal says, "there's a $10 minimum purchase for any credit card transaction." Well, ain't that a biznatch! Do you go back and find something else to buy? I don't. How dare they make me spend more than I intended to! These sly merchants aren't going to stop this practice until enough customers refuse to put up with it. 5. Familial guilt. You go out for breakfast with the family. Everyone's thirsty. The waitress comes by and asks what all of you will be drinking. "I want orange juice," says Junior. That starts a chain reaction of everyone in your party, grandma, grandpa, your husband or wife, even your toddler who can't even speak yet, asking for OJ. A glass of orange juice is $2.99 at IHOP! But you're having a good time, right? Until you get the check. Tell Junior he can have water next time. 6. Forget me not. You're organized...not! The bills come in one after the other and you do your best to keep track of which ones are due first. You get ahead of yourself and pay a couple of them weeks before their due date. The days go by and with the illusion of being in front of your bill paying schedule, you forget to check the stack again to see if any other are due. By the time you finally realize, one bill is overdue. Time to pay the late fee. My wife, Jessica, lost track of her DMV registration renewal bill. It was lost from late November until mid-January. She was charged a $30 late processing fee. Thanks California! We spend money blissfully, I'm sure, in more ways then we realize. All it takes on our part to put an end to it, is a concerted conscious effort. Why trouble ourselves picking up pennies, nickels, and dimes on the street if we are consistently being nickled and dimed by some of life's most seemingly innocent activities? It makes no sense! That's all for today. Thanks for reading. Be sure to leave a comment or subscribe to my blog and get posts like this one directly to your inbox.